Details: The invite only event will feature an exhibition of artist Kris Knight’s Smell The Magic. Details: New York cocktail bar, Death & Co will be taking over the bar at The Broken Shaker in honor of their book launch, Death & Co: Modern Classic Cocktails. Purchase tickets HERE. Location: The Broken Shaker at Freehand Miami, 2727 Indian Creek Drive. 7 to 10 p.m. Details: Harper’s Bazaar’s Digital Director, Joyann King, and Henri Bendel Creative Director, Pina Ferlisi kick off Art Basel with an intimate breakfast. Invite only. Details: Hosted by Ian Schrager and Stefano Tonchi, in partnership with the New Museum and Silencio. Expect private cocktails, performance and after party. Invite only! Location: The Mimi Beach EDITION, 2910 Collins Ave, 10 p.m. to 2 a.m. Details: Join Harper’s Bazaar’s digital director, Joyann King along with Sarah Harrelson, Criselda Breene, and Martina Borgomanero for an intimate preview brunch at the ShopBAZAAR boutique. Cointreau will be providing Cointreau Rickey cocktails for guests. Details: Learn about the life of a diamond from the rough form to the final, sparkling finish. Plus, get a chance to try on the Forevermark Exceptional Diamond Collection. Invite only. Location: ICA Miami, 4040 NE 2nd Avenue, 10 a.m. to 5 p.m. Details: Sip cocktails and nibble on hors d’oeurves while perusing the Exceptional Diamond Collection from Forevermark and art by local artists. Invite only. Location: ICA Miami, 4040 NE 2nd Street, 5 to 7 p.m. Details: Drink to the opening of Art Markit’s Art Basel Pop-Up experience. Shop pieces from dozens of artist designed-products, while sipping cocktails from the Baron Von Fancy Bar and enjoying tunes from guest DJs. Plus, score complimentary nail art from your favorite artists at Vanity Projects. Location: Mondrian South Beach Poolside, 1100 West Ave., 6 to 9 p.m. Details: Join Interview in celebrating the grand opening of the Institute of Contemporary Art. Inaugural exhibitions feature Pedro Reyes’ “Sanatorium” and Andra Ursuta’s “As I Lay Drying.” Invite only. Location: ICA Miami, 4040 NE 2nd St, 7 p.m. Details: Celebrate the next up-and-comers at this awards show, featuring performances by Jessie J, Betty Who, and more. Invite only. Location: Surfcomber Hotel, 1717 Collins Ave, 7 p.m. Details: Nadja Swarovski hosts a dinner to celebrate Thinning Ice by Jeanne Gang, inspired by the work of James Balog. Invite only. Details: Teleport with designer Alejandro Imgelmo, Haute Living, and The Webster as they travel to a different realm. Creations from Dwayne Wade, Li Ning, and Alejandro Inglemo will be unveiled. Invite only. Details: Join in the celebration of Performa’s 10th anniversary and Ryan McNamara’s ME3M 4 Miami with Interview, DSquared2, Maserati, and Thompson Miami Beach. DJ set by Lola Langusta, plus a surprise musical performance. Invite only. Location: Thomspson Miami Beach, 4041 Collins Ave, 10 p.m. to 1 a.m. Details: Join W’s Stefano Tonchi, Linda Evangelista, and Salvatore Ferragamo creative director Massimiliano Giornetti in celebrating the release of the book W Stories. RSVP to RSVPWMAG@KarlaOtto.com. Location: The Miami Beach Edition, 2901 Collins Avenue, Unit 901. 6:30 to 8:30 p.m. Details: La Perla, along with Harper’s Bazaar’s Laura Brown and Garance Dore will host an exclusive evening of shopping. A portion of the proceeds will benefit the Feed Foundation. Invite only. Details: Celebrate the arrival of Chrome Hearts in SoBe in their unique “factory style” showroom/art gallery/café. Featuring art from The Fahey/Klein Gallery plus photos from Chrome Hearts co-owner and designer Laurie Lynn Stark. Music provided by DJ Atlanta de Cadenet plus a live performance by Lolawolf. RSVP ArtBasel@chromehearts.com. Location: 4025 NE 2nd Ave, 7:30 to 11:30 p.m. Details: Artsy presents a dance party in the Miami Design District, hosted by Carter Cleveland, Wendi Murdoch, Peter Thiel, and Dasha Zhukova. DJ Sets by Theophilus London and Nar. Invite only. Details: Head to The Webster for an evening of cocktail-fueled shopping avec Marc Jacobs and Vanity Fair. RSVP to VFMJWebster@slate-pr.com. Location: The Webster, 1220 Collins Ave., 7 to 9 p.m. Details: In honor of “Triangle Walks,” an exhibition held in an original Jean Prouvé House, join Bally CEO Frédéric de Narp, Zak Kitnick, and Kolkoz in a cocktail celebration. Invite only. Location: Delano South Beach, 1685 Collins Ave, 7 to 10 p.m. Details:While Lady Starlight, the official DJ of Lady Gaga provides the soundtrack, take in a presentation of the latest home collection from Roberto Cavalli. The evening will feature the auction of the last three pieces of the Roberto Cavalli silver fish sculpture. Invite only. Details: Watchmaker Roger Dubuis will celebrate with hosts Jean-Marc Pontroue, Stephanie Seymour and Peter Brant in partnership with Dom Perignon. This exclusive dinner celebrates the trio of watches in the Velvet Haute Couture collection, with an after party to follow. Invite only. Location: Thompson Hotel, 4041 Collins Avenue, 7 p.m. Details: Join the star studded lineup of Miley Cyrus, Jeffrey Deitch, and Tommy Hilfiger to officially kick of Art Basel. Invite only. Details: Kick off Harper’s Bazaar’s day of beauty with an intimate class, hosted by Natura Bissé. Via an interactive demonstration, guests will learn tips and tricks of facial techniques. Givenchy beauty will offer makeup applications as well. Invite only. Details: Hosted by Inés de la Fressange and Bruno Frisoni, this lunch will ceelebrate the Roger Vivier and Ambra Medda collab for Misss Viv’ L’ArcoBaleno, a new bag designed by Bruno Frisoni. Featuring a DJ set by Nektar De Stagni. Invite only. Details: Join Swarovski for a talk on Crisis in the Designed Environment. Moderated by Joseph Grima, artistic director of Chicago Architecture Biennial, the talk will feature Jeanne Gang, architect of Thinning Ice for Swarovski and James Balog, photographer of Thinning Ice for Swarovski. Location: Miami Convention Center, P-Lot, Meridian Avenue and 19th Street, 3 to 4 p.m.
DetailsI: Head to contemporary art gallery, Galleria Ca’ d’ Oro for an exclusive look at Ludmilla Radchenko’s collaboration with sneaker label Ruco Line. Invite only. Location: Galleria Ca’ d’Oro, 4141 NE 2nd Ave, 4 to 6 p.m. Details: Join Jean-Christophe Babin, the CEO of Bulgari, along with Veronica Bulgari, Alberto Festa, and architect Peter Marino in the opening of the new Bulgari boutique. The event includes an opening ceremony, ribbon cutting, and a champagne reception. Location: Bulgari Bal Harbour Boutique, 9700 Collins Ave, 4 to 5 p.m. Details: Celebrate the “Lanvin Birds of Paradise” installation at the brand’s boutique in the Miami Design District with cocktails. Invite only. Details: Join Façonnable CEO Ludovic Le Gourrierec and The Webster’s Laure Heriard Dubreuil to celebrate the launch of the Façonnable and Jean Cocteau capsule collection. Invite only. Details: Join Pucci’s Peter Dundas and Laudomia Pucci for the US debut of Bisazza Wears Emilio Pucci. Invite only. Location: Bisazza Flagship, 3740 N.E. 2nd Ave, 6 to 8 p.m. Details: The Art Basel edition of the Disaronno Terrace will be featuring artist Jeremy Penn and his collection, “The Evolution and the Ego.” Music will be provided by DJ Christa Marie. RSVP to Yana@kiarahorowitz.com. Location: Gale Hotel Rooftop, 1690 Collins Ave., 7 to 10 p.m. Details: Join Crooks & Castles as they partner up with Naturel to throw a private party. Music by Va$htie and Heroes x Villains. Invite only. Location: 740 NW 25th St, 7 to 11 p.m. Details: Miami footwear boutique is hosting an after party avec streetwear label British Knights. Featuring art by Mwanel Pierre-Louis and music by DJ Daai Lo and DJ Aliyo. Location: The Freehand Miami, 2727 Indian Creek Drive, 10 p.m. to 12 a.m. Details: An invite only dinner will be hosted to celebrate the tome JEREMY SCOTT, published by Rizzoli International. The book features a foreword from Jeffrey Deitch. Invite only. Details: Who better to celebrate Art Basel with than Barbie and Jeremy Scott? Invite only. Details: Take part in the iconic celebration of Kim Kardashian’s epic Paper cover, as the magazine continues their quest to Break The Internet. With hosts Kim Hastreiter, David Hershkovits, Mickey Boardman, and Drew Elliott. Invite only. Details: To celebrate the launch of the collaboration between Laure Hériard Dubreuil and Eres, a rooftop lunch will be hosted at The Webster. Invite only. Details: Hosted by Britt MccVicker, make some dreamcatchers and get artsy all afternoon. 100 percent of proceeds will benefit Free Arts NYC, so purchase your tickets HERE. Location: The Freehand Miami, 2727 Indian Creek Drive, 4 p.m. to 6 p.m. Details: Designers Ryan Lobo and Ramon Martin invite you to sip cocktails in celebration of the launch of Portraits of Women. Hosted by Shirin Neshat. Invite only! Details: Club Monaco is opening up on Lincoln Road, and they’re tapped Jeffrey Deitch and street style artist Olek to help celebrate. Stop by for a cocktail or two and take a look at “Endless Outburst,” the window display made from 200 pieces of Club Monaco clothing all knit together. DJ Zoel will provide the music. Location: Club Monaco, 1006 Lincoln Road, 5 to 7 p.m. Details: Join ELLE DECOR editor-in-chief Michael Boodro and Fortis Development Group for a chat with Laith Sayigh of DFA and Anthony Spinello of Spinello Projects. There will also be an announcement on the 2015 ELLE DECOR Modern Life Concept House. Invite only. Location: Shikany, 251 NW 25th St, 5 to 7 p.m. Details: PHOTO Magazine has partnered with photog duo Markus&Koala to shoot their December cover girl, Nina Agdal. Celebrate the mag’s new ownership as well, with Lady Monika Bacardi and David Swaelens Kane. Invite only. Location: The National Hotel Miami Beach, 1677 Collins Ave, 6 – 9 p.m. Details: Join Ocean Drive and Duke Spirits to celebrate December cover girl, Krysten Ritter. The event will also serve as the premiere of the Hollywood Exposed: American Icons exhibit by photographer John R. Hamilton. Invite only. Location: W South Beach, 2201 Collins Ave, 8 – 11 p.m. Details: Acria and Paddle8 are throwing a family-style dinner at The Miami Beach Edition in honor of Ryan McGinley and a handful of other artists who have contributed to Acria. Invite only. Details: Mr. Brainwash will unveil his latest instillation, “Time is Beautiful” with Eva Longoria and Hublot CEO Ricardo Guadalupe. The evening will start with a presentation, followed by a private dinner, and an after party DJ’d by Swizz Beatz. Invite only. Location: Loren Ridinger’s Estate de Suenos, 4 p.m. Details: Add a new publication to your reading roster, and celebrate the arrival of Nah/No, an international art and culture glossy. Music will be spun by DJ Hurron, drinks and food will be provided by Broken Shaker. Enjoy complimentary Peroni from 2 to 3 p.m. and complimentary Perrier all day long. Location: The Freehand Miami, 2727 Indian Creek Drive, 2 to 6 p.m. Details: Celebrate 10 years of Haute Living with host Swizz Beatz. Guests will include Eva Longoria and street artists Swoon and Maya Hayuk, with DJ Hannah Bronfman providing tunes. There will be an auction to benefit Alonzo Mourning’s Mourning Family Foundation. Invite only. Location: Dean Estate, 8 p.m. Details: Join hosts The Bon Vivants, Esquire, and Imbibe for BBQ and afternoon drinks. Tickets, which can be purchased for $30 at the door, includes a limited edition Swig n’ Swine tank, unlimited BBQ, and punch, plus tunes will be provided by Mia Moretti and Myles Hendrik. All proceeds benefit Miami’s Overtown Youth Center. Location: Freehand Miami, 2727 Indian Creek Drive, 3 to 8 p.m. Details: Montauk makes its way to Miami with a Surf Lodge pop-up with many evenings of dinners, cocktails, and guest DJs including Chelsea Leyland, Mia Moretti, and Alexandra Richards. Details: Check out and shop pieces from dozens of artist designed-products, while sipping cocktails from the Baron Von Fancy Bar and enjoying tunes from guest DJs. Vanity Projects will also be on site with complimentary nail art manicures, so be sure to RSVP to RSVP@Collective-comm.com with your preferred time. Location: Mondrian South Beach Poolside, 1100 West Ave. Tuesday, December 2 to Sunday December 7 from 12 to 8 p.m. Details: Visit Architectural Digest‘s home in Miami as they pop-up for a three-day VIP Oasis at The James Royal Palm. Designed by Thom Filicia, the space offers art, cocktails, DJs, food, and a mini spa. Invite only. Location: The James Royal Palm, 1545 Collins Ave. December 4 to 6, from 1 to 7 p.m. daily. Details: Escape the Art Basel madness at Casa Elyx, located at the Miami Beach Edition Hotel. 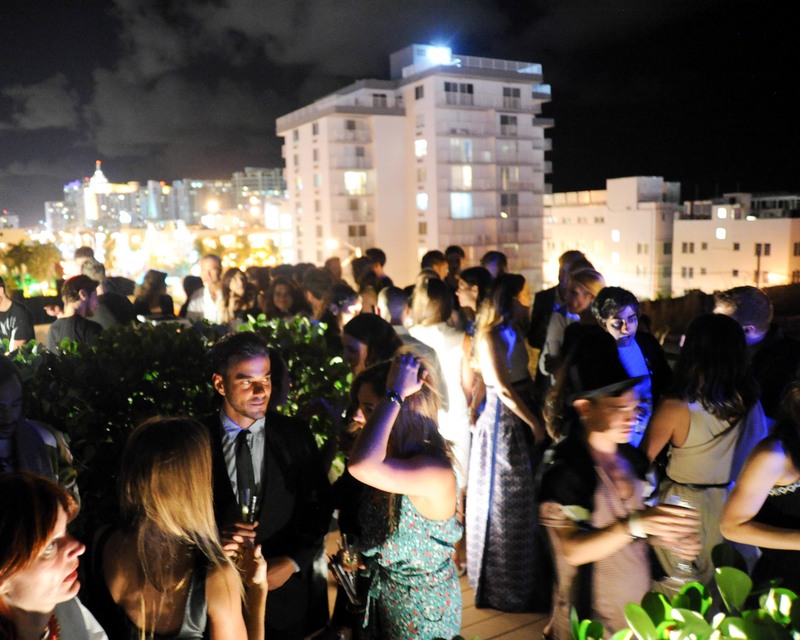 For three days, enjoy the rooftop pool, Absolut Elyx cocktails, and collaborations with Latin American artists including Gaston Ugalde, Cidade Matarazzo, and more. Invite only. Location: Miami Beach Edition Hotel, 2901 Collins Ave. December 3 to 6, from 3 p.m. until late. Details: Stop by the Freehand Lobby to shop brands like Vida Kush, Lost Boy Dry Goods, Style Mafia and more! Location: The Freehand Miami, 2727 Indian Creek Drive, Thursday, December 4 to Sunday, December 7. Details: The pages of Harper’s Bazaar come to life at the glossy’s Art Basel pop-up shop. Join in the three days of fashion, beauty, and shopping with brands like Vince, Henri Bendel, La Perla and Natura Bissé. Location: Soho Beach House, 4385 Collins Avenue. Open to the public Tuesday, December 2 from 1 to 6 p.m, Wednesday, December 3 from 11 a.m. to 6 p.m., and Thursday, December 4from 11 a.m. to 6 p.m. Details: In a carpark designed by Herzog & de Meuron, experience an interactive installation from art and architecture collective Snarkitectures. Limited edition AIRBALL products will be available for purchase, include Del Toro shoes. Location: 1111 Lincoln Road, December 1 to 7. Details: With 10 years to celebrate, Le Baron is back in Miami with their pop-up club. Ready to party? Location: FDR at the Delano, 1685 Collins Ave, December 2 to 7.